This article is about the transformation. For the manga chapter, see Super Saiyan?. For the anime volume, see Super Saiyan?! (Volume). For Dragon Ball Z: Budokai Tenkaichi 3 level, see Super Saiyan?! (Level). "How? How can you possibly have attained such power? No, don't tell me. No please, not that!" — Frieza realizing Goku's ascension into the Super Saiyan in The Angry Super Saiyan! Goku Throws Down the Gauntlet! Super Saiyan (超スーパーサイヤ人じん, Sūpā Saiya-jin) is an advanced transformation assumed by members and hybrids of the Saiyan race with sufficient amounts of S-Cells in the Dragon Ball franchise, though there have also been occurrences of other races or individuals taking on their own versions of the form. Earthlings (of Saiyan heritage) in Dragon Ball Online can also assume the transformation by wishing to have their dormant Saiyan powers unlocked. The Super Saiyan form first premiered in April 1991, within chapter 317 of the Dragon Ball manga, entitled "Life or Death". It also made its anime debut in 1991, first appearing in Dragon Ball Z episode 95, "Transformed at Last". Within Dragon Ball Z and Dragon Ball Super, three further powered up transformations: the second and third forms succeed Super Saiyan, while the premier form also has two additional graded states that focus on power, and also the final form which is superior to the graded forms. The original Super Saiyan form can also be mastered to improve some of its traits and remove some flaws. The ability to become a Super Saiyan was once considered to be nothing but a legend, as it had not been performed for over one-thousand years. Vegeta stated that a Super Saiyan has achieved a level of power so overwhelming that it could only be maintained in a transformed state. Despite only being told through legend, Frieza, who had Saiyans in his army, became paranoid over the possibility of truth behind the legend due to the constantly growing power of the Saiyan race. After receiving informal permission from the God of Destruction Beerus, Frieza finally decided to annihilate the Saiyan race by destroying Planet Vegeta, thus apparently sparking the end of the Super Saiyan legend. However, twenty-five years later, the Super Saiyan legend was proven to be true when Goku accomplished the feat during his titanic battle with Frieza. It was originally believed that the Super Saiyan transformation comes in response to a need, not a desire. Any Saiyan can become a Super Saiyan, however they require a large amount of S-Cells in order to take on the form, Saiyans who have a gentle spirit gain more S-Cells, but when a Saiyan increases their battle power they steadily gain more S-Cells. Once the Saiyan has enough S-Cells, a feeling such as strong anger or sadness can transform a Saiyan into a Super Saiyan, once a Saiyan has achieved the form they can transform into it any time by focusing their energy into their back to make it tingle. A Saiyan who has a very large battle power can turn Super Saiyan without needing a trigger, due to their tremendous amount of S-Cells. Saiyan offspring will inherit S-Cells from their parents, this is why Goten, Trunks and the hybrid clone Cell were able to become Super Saiyans so easily. Goku achieves the form out of anger over the murder of his best-friend Krillin and in a what-if scenario Bardock achieves the form out of anger after Chilled attacked a Plant child called Berry, while Vegeta achieves the form through sheer frustration at his original inability to achieve it, especially when Goku already had. While training in the Hyperbolic Time Chamber, Goku informs Gohan that becoming a Super Saiyan is powered by rage and told him to imagine Cell and then Frieza (after Gohan stated he had never seen Cell) killing all his friends in order for him to transform into a Super Saiyan. As the Saiyans train during Dragon Ball Z, they discover uncharted levels beyond the first Super Saiyan level. The power increases of subsequent Super Saiyan forms are so high that by the Buu Saga, the original transformation has been literally reduced to that of a "child's plaything" (as stated by Vegeta; as both Goten and Trunks can transform and harness the power adeptly at such a young age). No female Super Saiyans were seen in the Dragon Ball manga or anime until Caulifla achieved the transformation in Dragon Ball Super. However, the Dragon Ball GT Perfect Files implies that Pan has the potential to transform and might have become a type of Super Saiyan never seen before. Female Super Saiyans have since appeared in video games, including Dragon Ball Online, Dragon Ball Heroes and Dragon Ball Xenoverse. When transforming into a Super Saiyan in Dragon Ball Super: Broly, Vegeta briefly gains green hair like that of the Legendary Super Saiyan form. In the Super Dragon Ball Heroes anime, Goku and Vegeta's transformation effect into Super Saiyan is the same as Super Saiyan Blue - though in this case they are enveloped in a golden aura which cracks around them - while Future Trunks is the normal Super Saiyan transformation effect. In Dragon Ball Super, while explaining Goku's Super Saiyan form to Beerus as they were watching parts of Goku's battle with Frieza, Whis mentions that the Saiyan's knowledge of the form was lost to their race at some point in the past, resulting in it being viewed by most Saiyans as little more than a legend until it was rediscovered by Goku and the surviving Saiyans. The Namekian Grand Elder Guru also showed some awareness of the existence of Super Saiyans when he mistakenly thought that the Nameless Namekian had been killed by a Saiyan while speaking to Krillin about Kami and Piccolo's deaths, unaware of their split until after he probed Krillin's mind. Guru implied that only a Super Saiyan would have the power to kill a Super Namekian like the Nameless Namekian. This indicates that Namekians may have encountered Super Saiyans in the distant past or had heard about them during the time the Namekian people were an interstellar race, as Guru possessed knowledge of them and the legend concerning the Original Super Saiyan God recorded in the Namekian Book of Legends. In Dragon Ball GT, Old Kai was shown to be aware of both the Golden Great Ape and Super Saiyan 4 forms which are only accessible to Saiyans who have achieved the Super Saiyan form yet also capable of transforming into a Great Ape, indicating that Super Saiyans, Golden Great Apes, and Super Saiyan 4 had previously existed at some point in the past for Old Kai to possess knowledge of those transformations. In the Dragon Ball Super manga, it is shown that when a Super Saiyan's power surpasses the power of the Super Saiyan God form, it will naturally progress into a Super Saiyan God Super Saiyan. The initial incarnation of the Super Saiyan form was created by Toei Animation and used in the movie Dragon Ball Z: Lord Slug, however this was later retconned into being the "False Super Saiyan" form after the debut of the real Super Saiyan state in the manga. The primary reason why Akira Toriyama created the Super Saiyan state with gold hair was so that his assistant would no longer have to spend so much time coloring Goku's hair black - thus saving time. Due to also having the effect of making Goku appear stronger, it killed two birds with one stone. "The power comes in response to a need, not a desire"
— Goku in "Bow to the Prince"
The first Super Saiyan transformation occurs when a Saiyan who has reached a very high level of power loses himself in a fit of rage. It can be achieved by any Saiyan who has a high battle power above the standard level. However, in the anime the transformation must be triggered in response to a great need, an example being in Goku's case to defeat Frieza. Intense rage may not be the actual or only source, but merely a focuser, as Goten proved able to obtain his form instinctively. To which, in Dragon Ball Super, Cabba described the process of as experiencing a tingling sensation of focusing one's energy emanating from the user's back (seemingly centered in a point along the spine) between the shoulder blades, Caulifla simply followed these instructions to transform into the state. The most noticeable physical change is that the Saiyan's hair becomes golden blonde in color and seems to stand on end, giving it a rising, flame-like appearance. This applies to all of the Saiyan's hair except (in most cases) the tail, including scalp hair, eyebrows, and the fur when a Golden Great Apes. Natural eye color changes to a greenish-blue, muscle tone becomes more defined, and the skin tone (and clothing) becomes lighter mainly due to the energy and light output of the golden aura. As the natural floodgates of the body are opened with the transformation, excess energy is radiated from the body in the form of a pulsing, flame-like aura. There is also a marked personality alteration, where the Saiyan becomes unusually aggressive and more prone to acting on impulse. When the female Saiyan Kale becomes a Super Saiyan, her hair turns green. It can be noted that in Dragon Ball Online, in the event a Saiyan character is bald they will gain a mohawk of golden hair when they turn Super Saiyan. The Super Saiyan transformation also has an interesting, unique effect on Goku's family in addition to its normal effects: the way their eyes are drawn changes slightly. Normally, the outline around the eye is not fully drawn and it circles around about 3/4 of the way the eyeball while the overall shape of the eyes are rounder. When in Super Saiyan, their eyes are fully surrounded by an outline and are sharper and narrow in shape, the same way that all villains are drawn; this is mainly due to Akira Toriyama wanting to show the anger and hatred that must be present for a Super Saiyan transformation. Though, this is not the case for the Full-Power Super Saiyan state, as shown with Goku and Gohan during the Cell Games Saga with their eyes having a softer overall shape while not fighting. It is theorized by Krillin that the Super Saiyan transformation prevents Goku from performing his Spirit Bomb technique. One must be pure of heart to perform the Spirit Bomb technique, and as a Super Saiyan, Goku's heart is full of rage, although not necessarily contaminated by evil. In the film Dragon Ball Z: Super Android 13!, when Goku becomes a Super Saiyan after gathering power for his Spirit Bomb, he loses control of the energy and instead absorbs it into his own body. During the Kid Buu Saga, Goku assumes the transformation only after successfully creating and throwing the Spirit Bomb, although it could just be that anger no longer filled his heart when he transformed since this took place after he mastered the Super Saiyan form during the Cell Games Saga or that anyone can wield the Spirit Bomb after it has been formed. When a Super Saiyan achieves an extremely high level of power, they will exhibit sparks around their aura (like a Super Saiyan 2), this has only been displayed by Vegito, Goku (only in the anime), and Goku Black. Super Saiyans from evil hybrid races will sometimes exhibit white hair. Examples of this include Fused Zamasu in his Super Saiyan Rosé form in Dragon Ball Super, Vegeta's Super Saiyan form and Strongest Forms when his body was infected by the Tuffle Baby in Dragon Ball GT, as well as Mira's own unique transformations as his identity as a hybrid Saiyan in Xenoverse 2 and Heroes. However, it has never been stated in any Dragon Ball media (anime, manga, video games, etc.) that the reason these Saiyan hybrids have White hair in their Super Saiyan forms is due to them being evil Saiyan hybrids. While physical change is not too drastic apart from a slight increase in muscle mass, the power output increase is colossal; it was stated by Akira Toriyama that when he was writing the manga the form was meant to be 10x what Goku had previously accomplished, in Daizenshuu 7 the form is said to multiply the Saiyan's power level by 50x times its normal amount, which Toriyama considers to be an exaggeration. In the Dragon Ball Z: The Anime Adventure Game, the multiplier for the form is 2.5x the user's normal amount of power). The form's multiplier seems to have changed in Dragon Ball GT, When Goku utilizes the Super Saiyan form against General Rilldo in Dragon Ball GT, Rilldo states that Goku's power has increased to just over double his base form (in the English dub he states that it has increased a hundredfold). 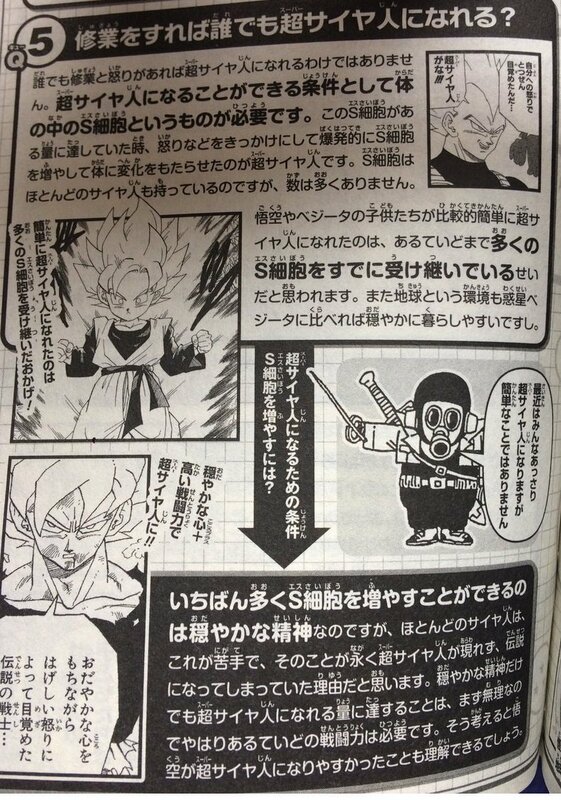 In an interview, Akira Toriyama noted that since Super Saiyan 2 and Super Saiyan 3 are simply powered up Super Saiyans, completely mastering the normal state and the Super Saiyan form would lead Super Saiyan to being stronger than Super Saiyan 2 and Super Saiyan 3, thus presumably giving the hypothetical fully mastered Super Saiyan a multiplier of over 400x base. The form was achieved by Goku after witnessing his best friend Krillin's death at the hands of Frieza. In this form, Goku's power grossly outclasses the evil tyrant's, a feat made more impressive by the fact that, prior to the transformation, Goku was no match for him, even with the Kaio-ken multiplying his power 20-fold. This suggests the transformation multiplies the user's power by considerably more than 20. In order to combat Goku's sudden burst of strength and power, Frieza released all natural bodily inhibitions and utilized 100% of his power, only half of which he used to stop Goku's Kaio-ken x20 Kamehameha attack. Though he seemed to gain the upper hand while Goku holds back, he loses faith when he realizes that his attacks are no longer debilitating, with Goku merely shrugging off his most forceful blows. This is evident, because, in his 100% final state, Frieza had gained power and speed, but also gained increased energy consumption to the point where his damaged body could no longer handle the amount of power he was controlling. Two years following the titanic battle on Namek, Future Trunks would arrive from the future already possessing the ability to transform, much to the astonishment of Vegeta and other present company, and effortlessly disposed of the synthetically restored Frieza, and his father, King Cold. Sometime later, Vegeta also achieves the Super Saiyan transformation, mainly due to his belief that he had pushed himself to his utmost limits without actually transforming and due to seeing that Goku had achieved the form whilst he did not. By his own admission, it was anger at himself that triggered the intense emotion required to transform. He also noted, that he too possessed a pure heart, only one of pure evil as opposed to Goku's good. With this new power under his belt, Vegeta confronts and overcomes Android 19 and Dr. Gero, blithely killing #19 with the powerful Big Bang Attack. However, the Super Saiyan form is truly put to the test when the true Androids of Future Trunks' grim prediction, Android 17 and Android 18, arrive. Super Saiyan Vegeta does battle with Android 18 until he is eventually overpowered and even has his arm snapped by a fierce kick from the deadly beauty. Future Trunks jumps in on the battle, prompting #17 to intervene. The Androids easily defeat both Vegeta and Future Trunks in their Super Saiyan forms along with the other Z Fighters; Future Trunks, in particular, being felled by a single blow from #17, as opposed to the trained Vegeta who withstood a much longer beating, signifying his superior strength. This power is noted by Kami as he brings up the topic of how Vegeta is now more powerful than Future Trunks, who "killed Frieza and his father in an instant." The limits of the Super Saiyan transformation were pushed even further with the introduction of Cell. With the basic Super Saiyan form now unable to combat the power of the Androids, Goku advises training in the Hyperbolic Time Chamber because he believes that there is a way to ascend past the normal limitations of an untrained Super Saiyan, and doing so would make them strong enough to take down the Androids. By the time Cell had reached his Perfect Form after absorbing both the Androids, Vegeta, Future Trunks, Goku, and Gohan had all spent time in the Hyperbolic Time Chamber, advancing to new Super Saiyan forms. The Super Saiyan's standard output of power would be outclassed by the second and third stages. Unlike Vegeta and Future Trunks who made use of these stages (which either consumes one's energy rapidly and produces an increasingly higher level of strain, or reduces the Saiyan's speed to nil, with the latter doing both), Goku and Gohan work to perfect the initial transformation after deciding that it was the best form to use overall, prompting their transition into Super Saiyan Full Power, the concept of making the Super Saiyan form no different in energy output and strain than the basic form of the user's body. The initial transformation and its advanced grades are later rendered obsolete by the introduction of a far more powerful level, Super Saiyan 2 (which is the form used by Gohan to defeat Cell), followed by Goku's introduction of Super Saiyan 3 during the Majin Buu Saga, and finally, Super Saiyan Rage, introduced in Dragon Ball Super. Super Saiyan 2, Super Saiyan 3 and Super Saiyan Rage are nothing more than powered-up variations of Super Saiyan. If the normal state and regular Super Saiyan form were to be fully mastered, it would increase its user's level more than the Super Saiyan 2 and Super Saiyan 3 forms, and would sap less energy. In the special chapter "Trunks The History - The Lone Warrior" and the television special Dragon Ball Z: The History of Trunks, Future Gohan is shown to have gained the Super Saiyan transformation long ago, most likely after witnessing the Z Fighters being slaughtered by the Androids. Therefore, Future Gohan may have assumed his transformation before his present timeline counterpart (by technically a matter of days), although he was far weaker because he was never trained by his father in the Hyperbolic Time Chamber and never mastered the Super Saiyan form. After he is killed, we see Future Trunks transform for the first time (only in the anime, for Trunks seemed to already have attained the transformation rather recently in the original manga), thus showing his original transformation. Goten and Trunks, sons of Goku and Vegeta respectively, attain the ability to transform at a remarkably young age, again to widespread surprise from the main cast. (Goten, who was about a year younger than Trunks' age of eight, stated that his transformation was so long ago that he was unable to even remember it occurring.) Though their reasons for so easily transforming are never officially stated, the common theory is that it could have been the DNA inherited from their fathers' ability to transform already during their conception, supported by the fact that it took Gohan, who was also a child when he made his transformation, unbearable hardship to achieve (Gohan was born prior to the start of Dragon Ball Z, before his father's transformation). However, it is unknown if Vegeta achieved the ability to transform before Trunks' conception or after it, the manga implies that Vegeta stayed on Earth entirely focused on intense training to become a Super Saiyan before he grows close to Bulma so it's possible he transformed before Trunks' conception. In Future Trunks' case, he would have been conceived in the Alternate timeline under very similar circumstances, although it is possible he was not conceived after Future Vegeta became a Super Saiyan, as the alternate counterpart's transformation was never shown. However he was still able to transform at the age of 14 (making him either the youngest or second youngest Super Saiyan in the alternate timeline, depending on when Future Gohan transformed), although he was considerably weak due to the lack of training. When the Bio-Android Cell, and his counterpart from Cell's timeline fight at their full power in their Imperfect and Perfect forms, and are surrounded by a golden aura, they are in the Super Saiyan form - thanks to their cells from Future Goku and Future Vegeta. This is especially notable in the anime, as when Cell powers up to max he gains the golden Super Saiyan aura, and the Super Saiyan transformation sound effect plays. After the battle with Beerus, Goku realized that fully-mastering the Super Saiyan form would lead to it being stronger than the Super Saiyan 2 and Super Saiyan 3 forms. Goku Black uses his standard Super Saiyan form in battle with Super Saiyan Vegeta in the Dragon Ball Super manga. After managing to gain a huge amount of power from a near-death experience, Goku Black's Super Saiyan form evolved into his Super Saiyan God Super Saiyan form: Super Saiyan Rosé. It is unknown if Goku Black can still become an ordinary Super Saiyan, and if he can what level of power it would possess, as when Goku's god-enhanced Super Saiyan form evolved into Super Saiyan Blue, it also caused him to re-acquire his non-god-enhanced Super Saiyan form. In some video games, Super Saiyan Rosé, a Super Saiyan God Super Saiyan form, acts as Goku Black's and Fused Zamasu's own version of the first, standard Super Saiyan form, although with Godly ki, as Goku Black and Fused Zamasu are natural gods. The Godly ki which Super Saiyan Rosé has in the Dragon Ball Super anime (and manga) renders the Super Saiyan Rosé form as a Super Saiyan God Super Saiyan form as well, as the Super Saiyan God Super Saiyan forms are basically the first Super Saiyan form combined with Godly ki. During his battle with Beerus, after the Super Saiyan God transformation reverted to normal, Goku proceeded to use his Super Saiyan form to keep on with the battle, deflecting and negating Beerus' universal-destroying punches, indicating that once enough of that raw godly power is absorbed, a Saiyan could easily attain the power of the gods and become just as strong as them without requiring to transform into Super Saiyan God again. During the "Future" Trunks Saga, Gohan is forced to use the form while fighting the Watagash-possessed Barry Kahn as his alter-ego Great Saiyaman. While using the form as Great Saiyaman, it was dubbed Super Great Saiyaman by the director of "Great Saiyaman vs. Mr. Satan". Due to his Great Saiyaman helmet concealing his hair and eyes, Great Saiyaman's appearance doesn't change as much aside from his Super Saiyan aura and Great Saiyaman suit glowing brighter. In this form, he easily defeats the Watagash with his Super Great Saiyaman Beam. In the last episode of Dragon Ball GT, Goku and Vegeta's descendants, Goku Jr. and Vegeta Jr., are shown to be able to transform into Super Saiyans from a young age, as well. Goku Jr.'s first transformation in particular was shown in the TV special Dragon Ball GT: A Hero's Legacy, aired at around the time that episode 40 was broadcast. This heavily contradicts the Daizenshuu books' explanation that Pan could not transform due to the minuscule percentage of Saiyan blood in her, as being a grandson of the already 1/4 Saiyan Pan would reduce his to no more than one sixteenth, making him almost completely human. The Super Saiyan transformation made its movie debut in the film Dragon Ball Z: Cooler's Revenge. Goku uses his Super Saiyan power to defeat Cooler, Frieza's older and stronger brother, thus finishing off the family. In the concept art drawn by Akira Toriyama for this movie, Super Saiyan Goku has red eyes (as seen to the right). The Super Saiyan form is also used in the next two films Dragon Ball Z: The Return of Cooler by Goku and Vegeta to combat and finally kill Cooler, and in the film Dragon Ball Z: Super Android 13! by Goku, Vegeta, and Future Trunks to take down Android 14, Android 15, and Android 13. In the next film Dragon Ball Z: Broly - The Legendary Super Saiyan, the Saiyan Broly is also shown to harness the original Super Saiyan transformation, which is what he uses to battle Goku for a few moments when attacking him in the dead of night. He also uses it against Goten and Trunks in Dragon Ball Z: Broly - Second Coming, until he was forced to unveil his Legendary Super Saiyan form once again when fighting Gohan in his Super Saiyan 2 form. It was also very briefly used by Future Trunks during his match against Tien Shinhan, and then by Gohan, Vegeta and Future Trunks to fight against the Galaxy Soldiers in Dragon Ball Z: Bojack Unbound. During the events of the manga and anime Dragon Ball: Episode of Bardock, Bardock is sent back in time during the destruction of his people and becomes a Super Saiyan on Planet Plant while fighting Chilled, an ancestor of Frieza. In Dragon Ball Z: Resurrection ‘F’, Gohan is the only one who uses the regular Super Saiyan form in the film (aside from a brief flashback of Future Trunks defeating Frieza, and Super Saiyan Goku's appearance in the prologue from the "Future Trunks Special Edition" of the film). Goku and Vegeta use a new Super Saiyan form in the film that has blue hair and godly ki, after mastering Super Saiyan God, named Super Saiyan Blue. In Dragon Ball Super: Broly, Goku and Vegeta both use this form against Broly but are overwhelmed by his Wrath State. Gogeta displays power superior to Goku and Vegeta as Super Saiyan Blues, henceforth able to fight on par with Broly as Super Saiyan C-type. In Dragon Ball Z, the possibility of a power greater than that of a Super Saiyan is first theorized in the episode "Laboratory Basement", when Krillin and Future Trunks contemplate how Vegeta plans on retaining his dominance in power among the Z Fighters. The first of these new heights in power is the Super Saiyan Second Grade stage obtained by Vegeta, Future Trunks and, later, Goku. This technique (as well as the Super Saiyan Third Grade technique that follows) is essentially a method of enhancing the abilities of a Super Saiyan, rather than a complete departure from it in favor of newer and more unique power. It is not until the Cell Games that this uncharted level of power makes its debut, in the form of Super Saiyan 2. Saiyan characters continue pushing their limits during the series, ultimately discovering a third level. Super Saiyan: The standard Super Saiyan transformation. It is achieved when a powerful Saiyan reaches varying levels of anger, as shown by Goku when Frieza killed Krillin, and Vegeta when Goku surpassed his abilities, though some half-Saiyan hybrids have been shown to attain the form without any stressful circumstances. In some media, Super Saiyan Rosé is simply Goku Black's version of this form, however, Akira Toriyama's own notes on the Super Saiyan Rosé form state it is a Super Saiyan of a slightly different color, separate from Black's ordinary Super Saiyan form. Pseudo Super Saiyan: A movie only pseudo-Super Saiyan form with an orange-yellowish surge of aura. It only appears in the movie Dragon Ball Z: Lord Slug. It was originally conceived as being the Super Saiyan form but was later re-labeled as "Pseudo Super Saiyan" when the true Super Saiyan form was shown. Power Stressed: The results of a forced power output increase in the initial Super Saiyan form. Super Saiyan Second Grade: An advancement in the power of the original Super Saiyan state. This is Vegeta's primary state in the Perfect Cell Saga. Super Saiyan Third Grade: An even stronger advancement in the power of the original Super Saiyan state, however, it lacks speed as increased muscle size restricts movement. Future Trunks uses this form in the Perfect Cell Saga. Super Saiyan Full Power: A form identical to the first grade of Super Saiyan in almost every way. However, unlike the first grade, it possesses great ki control and removes the restless feeling of the form, making it like a natural state. Goku and Gohan would be the first to master this state during their training in the Perfect Cell Saga. Super Saiyan with the mastered energies of a god: A powered-up version of the Super Saiyan form which acts as the predecessor to Super Saiyan God Super Saiyan. Once the user of this state manages to get it to a high enough level of power, it evolves into the Super Saiyan God Super Saiyan form, and thus re-allows access to the ordinary Super Saiyan form. Goku gained this state by retaining the strength of Super Saiyan God in his Super Saiyan form, while Goku Black gained it through a near-death power up. Broly-type Super Saiyan: The heightened Super Saiyan forms only displayed by Broly and his clone noted to be a different evolution of Super Saiyan from the graded forms and levels 2 and 3. Super Saiyan A-type: Broly's Super Saiyan in his first appearance has blue and/or purple hair due to the use of a Mind Control Device. Super Saiyan C-type: This Super Saiyan form is the non-full powered version of the Legendary Super Saiyan form, and is a variation of the first, standard Super Saiyan form, being an evolution of the latter form. Super Saiyan C-type is the standard Super Saiyan form of a Legendary Super Saiyan. Legendary Super Saiyan: This form is the Final Form of the ordinary Super Saiyan state. Super Saiyan 2: The second Super Saiyan transformation. Achieved either through intense rage, or training. Further intense training allows the user to power their Super Saiyan 2 form up to Super Saiyan 3 level power. Legendary Super Saiyan 2: This form is the Final Form of the Super Saiyan 2 state. Super Saiyan Rage: A massively powered-up Super Saiyan 2 form displayed in the Dragon Ball Super anime. The transformation is gained when the user already possesses the Super Saiyan 2 form, and then undergoes an extreme burst of rage. Super Saiyan: Berserk: A berserk version of Super Saiyan 2. Super Saiyan 3: The third Super Saiyan transformation. Achieved through training. Super Saiyan 3 Full Power: A more powerful version of the Super Saiyan 3 form. Legendary Super Saiyan 3: The Final Form of the Super Saiyan 3 state. While not normally said to be part of the main Super Saiyan line, in the Dragon Ball Super manga Goku Black refers to Super Saiyan God and the Super Saiyan God Super Saiyan forms as Super Saiyan forms, implying that these forms are part of the normal Super Saiyan transformation line. Super Saiyan God Super Saiyan: A hybrid Super Saiyan form which is the result of a Saiyan combining the power of Super Saiyan God with the first Super Saiyan form. The color of the resulting form differs depending on whether the user is mortal or an actual deity when obtaining the form. Introduced in Dragon Ball Z: Resurrection ‘F’. Super Saiyan Blue: The result of a mortal Saiyan mastering the power of Super Saiyan God and then transforming further into a Super Saiyan, resulting in a new transformation combining these two forms. Perfected Super Saiyan Blue: A manga-exclusive form in which the user seals the overflowing power of the Super Saiyan Blue form inside themselves, allowing them to constantly utilize the form's full power. Super Saiyan God SS Evolved: A form beyond Super Saiyan Blue achieved when a Super Saiyan Blue breaks their limits. Super Saiyan Rosé: A Super Saiyan God Super Saiyan form that can only possibly be obtained by Saiyans who are actual deities. The transformations alternate coloration in contrast to Super Saiyan Blue is due to its user being an actual god with natural Godly Ki when they obtained the form. In the anime, the users of this form also gain access to a special ability to refine their ki to alter the shape, length, and features to many of the user's techniques. Golden Great Ape and its final form equivalent: A Saiyan Great Ape transformed into a Super Saiyan. Introduced in Vegeta's flashback on Namek in Dragon Ball Z (anime) and appears in Dragon Ball GT. Super Saiyan 4: The fourth and chronologically, final Super Saiyan transformation which occurs when a Saiyan is able to regain control while in Golden Great Ape form. Introduced in Dragon Ball GT. Super Full Power Saiyan 4: An enhanced version of the Super Saiyan 4 form, where the user gathers an extreme amount of energy, pushing themselves dangerously beyond their normal limits for a brief period of time. Super Saiyan 4 Full Power: An enhanced version of the Legendary Super Saiyan 4 variant of the form attained by Broly. Tuffleized Super Saiyan: A white-haired variant of the Super Saiyan form used by a fully Tuffleized Saiyan. A user of this form can ascend further into the Strongest Forms by obtaining more energy. Introduced in Dragon Ball GT. Strongest Form 1: The Saiyan-Tuffle hybrid's equivalent of the Super Saiyan 2 form. Introduced in Dragon Ball GT. Strongest Form 2: The Saiyan-Tuffle hybrid's equivalent of the Super Saiyan 3 form. Introduced in Dragon Ball GT. Super Fu: The Demon-Saiyan hybrid version of the first Super Saiyan transformation that replaces the golden glow and green irises with white pointed hair and blood red eyes. Introduced in Dragon Ball Heroes. Mira's Final Form: A form used by Mira in Xenoverse 2 in which Mira's hair grows out and white fur covers much of his body much like a Super Saiyan 4 though he lacks a tail and it is the result of Mira absorbing Towa and Tokitoki's Egg, however this absorption was so Mira could evolve himself further indicating that it may be Mira's own unique Demon-Saiyan hybrid version of the Super Saiyan 4 form which may also explain the form's lack of a Saiyan tail. In Heroes, Super Mira can achieve the form by absorbing Demon God Towa. Several video games introduced alternate variations of the Super Saiyan transformations, which while treated as just "Super Saiyan" in the manga and anime, are featured as different transformations here. GT Super Saiyan: In the Dragon Ball Collectible Card Game only, the Super Saiyan form used by characters in GT is treated as a separate transformation: the "GT Super Saiyan" form. This form multiplies the user's base power by around double (in the dub it is said to power the user up to a hundredfold). Super Vegeta: An alternative variant of the Super Saiyan form usable by Vegeta and the Future Warrior in Xenoverse, it has greater ki manipulation than a normal Super Saiyan and a different transformation scene. Super Vegeta 2: An alternative variant of the Super Saiyan 2 form usable by Vegeta and the Future Warrior in Xenoverse, it has greater ki manipulation than a normal Super Saiyan 2 and a different transformation scene. Future Super Saiyan: An alternative variant of the Super Saiyan form used by Future Trunks, Xeno Trunks, and Future Gohan in Dragon Ball Xenoverse 2, which the Saiyan Future Warrior can also use. This transformation has a greater ki recovery than a normal Super Saiyan. This transformation's stance is taken from Future Gohan when he transformed during his initial fight with the Androids in the Dragon Ball Z: The History of Trunks TV special. Villainous Mode (Super Saiyan): A Villainous Mode enhanced Super Saiyan form used by Future Trunks and Gotenks, it has the appearance of Super Saiyan 3 when used by Gotenks. In Xenoverse 2 it is used by Teen Gohan in a parallel quest. Villainous Mode (Super Saiyan 2): A Villainous Mode enhanced Super Saiyan 2 form used by Vegeta and Gohan, it has the appearance of Potential Unleashed when used by Gohan. Broly•Supervillain: A Supervillain Mode enhanced version of the Legendary Super Saiyan form used by Broly after having some of his life shaved off to increase his power. In the first phase, he gains glowing eyes and a dark black & white aura though it simply acts as a powered-up version of his Legendary Super Saiyan form and only becomes a true hybrid transformation until it reaches the second phase. In the second phase, his body transforms causing his eyes to glow pink and gain a glowing Time Breaker infinity symbol on his forehead, while his hair to turn white while his skin and clothing to become luminously pale, as well as emitting a more intense black & white aura. The second phase is playable in Xenoverse 2. Fusion Super Saiyan forms: Several apparent hybrid Super Saiyan forms created via fusion, which only appear in Dragon Ball Fusions. There are many transformations related to the Super Saiyan form, but despite their names or traits, they are not part of the main transformation line. Gohan-type Super Saiyan: The Potential Unleashed form used by Gohan. This state is a different transformation to Super Saiyan and is superior to Super Saiyan 2 but has no relation to the Super Saiyan 3 form. Super Saiyan God: A godly transformation initially achieved through a special ritual. Broly God: A godly transformation only displayed by Broly. Its power surpasses Super Saiyan Blue. Super Neko Majin: The Neko Majin equivalent of Super Saiyan, which is gained from a Neko Majin copying a Super Saiyan transformation. Since the release of Dragon Ball Z: Super Saiya Densetsu in January 1992, the Super Saiyan form is featured in all the Dragon Ball Z video games. Dragon Ball Online is the very first video-game that allows the player to transform his created character into Super Saiyan. The Human race can acquire the transformation at level 40 after obtaining the Dragon Balls and having the wish granted by Shenron; Humans can take on the Super Saiyan transformation due to them being direct descendants of both Goku and Vegeta, therefore possessing Saiyan blood. Like in the original series, those under the influence of the Super Saiyan transformation discharge a golden aura that surrounds their bodies and acquire the trademark green eyes and golden, altered hairstyles (in the game, each Human hairstyle [male and female] has a Super Saiyan counterpart). Players that choose not to allow their avatars age can acquire the Super Saiyan transformation as children. Also, unlike the other two transformations, techniques acquired in a Human's base form are still accessible, however, Super Saiyans does not obtain transformation-exclusive skills as the other races do. Dragon Ball Heroes also features female Super Saiyans. Only Mira attained the Super Saiyan form so far, albeit being his own version of it. Beginning in July 2015, Mira achieved the Super Saiyan form known as Super Mira. In Dragon Ball Xenoverse, the Super Saiyan transformation is an ultimate skill that constantly drains the user's energy and completely drains their stamina once the transformation is over. The benefits are that all abilities are increased for the duration, and all super and ultimate attacks no longer cost ki. A Saiyan Future Warrior can obtain this transformation after the Frieza Saga via Parallel Quest 14: "Legendary Super Saiyan" or after the Android Saga via purchasing it at the Skill Shop. The ability comes in two variations, the normal Super Saiyan transformation which raises the power of strike skills, and Super Vegeta which raises the power of ki blasts. It is also shown in a time fragment timeline that Captain Ginyu can utilize the Super Saiyan form while in Goku's body. In Dragon Ball Xenoverse 2, the Super Saiyan form and its higher levels no longer drain ki, allowing a Saiyan to stay in the form indefinitely, but the rate of ki gain during attacks decreases with each progressive form and Super and Ultimate attacks cannot be used indefinitely. It is no longer an Ultimate Skill and is instead accessible via the Super Saiyan Awoken Skill which can be attained by the Saiyan Future Warrior inside the Capsule Corporation time rift anomaly in a special quest with Vegeta. After sparring with Vegeta a few times, Vegeta will notice Future Warrior is not transforming and learns that despite their power, the Warrior has not yet unlocked the transformation. After speaking with Bulma and Kid Trunks at Vegeta's suggestion, the Capsule Corporation Quest: "Saiyan Awakening" is unlocked. In this special quest, the Future Warrior faces off against Super Saiyan 2 Vegeta and Super Saiyan 2 Goku to push them in unlocking their Super Saiyan form. The Awoken Skill is unlocked mid-battle and becomes permanently unlocked. 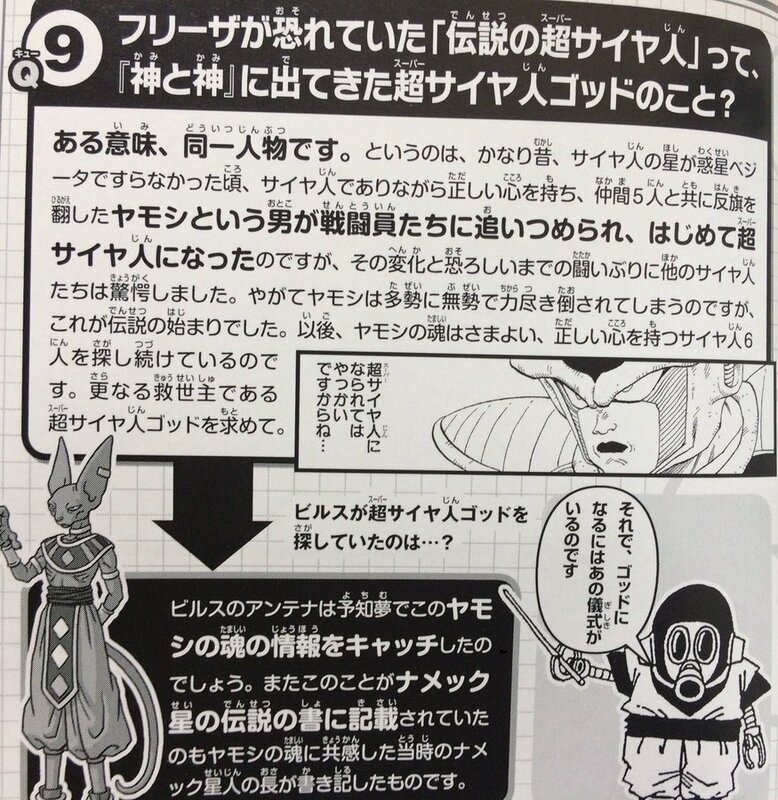 In addition, the player can transform into a Super Saiyan 2 or 3 depending on how much ki they currently have (the Super Saiyan form requires 3 ki bars, while Super Saiyan 3 requires 5 or more). The Future Warrior can also unlock 2 alternate Super Saiyan forms. The Future Warrior can unlock Super Vegeta Awoken Skill by completing Vegeta's final sparing session inside the Capsule Corp time rift which allows them to transform into Super Vegeta and Super Vegeta 2, which like Xenoverse increases the power of ki blasts. They can also unlock the Future Super Saiyan Awoken Skill by collecting all 5 Distorted Time Eggs to unlock the Unknown History Saga and then completing "Resolute Trunks - History Is Born". The Future Super Saiyan form charges ki much faster than other Super Saiyan forms, though unlike the other two Super Saiyan Awoken sills, it lacks higher forms. Like in Xenoverse, Captain Ginyu can utilize Goku's Super Saiyan form as an enemy. "We have a legend that a Super Saiyan will appear once every thousand years. We don't even know how much power a Super Saiyan would be packing, but they'd be the universe's strongest being for sure! Heh heh heh... If Vegeta and I keep training, one of us might be able to make that leap. Just imagine how awesome I'd look as a Super Saiyan..."
Nappa mentions the legend to the Future Warrior while working as their Instructor and notes that if he and Vegeta keep training one of them might make the leap to Super Saiyan before thinking about how awesome he would look as a Super Saiyan. After the 1.09.00 Update, the Super Saiyan Awoken Skill can be added to Nappa's custom skillset after it has been purchased in Partner Customization. As a result, Nappa is able to achieve his Super Saiyan form, though due to his baldness only his facial hair changes color, his eyes turn green, and he gains a Super Saiyan aura. Nappa's Super Saiyan Awoken Skill is a single transformation and lacks higher level forms. Since its first appearance, the Super Saiyan has become one of the most iconic images of Dragon Ball Z. Before the Super Saiyan concept debuted, the term was first mentioned in the original English dub when Vegeta mockingly refers to Gohan as "the little Super Saiyan" in the episode "Stop Vegeta Now!". In the Japanese version, the term is first brought up by Nappa after Raditz was killed by Piccolo; Vegeta comments how a half-Saiyan like Gohan seemingly has the potential to become stronger than a full-blooded Saiyan, which Nappa then dubs as a Super Saiyan. However, in the Funimation re-dub of the same scene, Vegeta instead tells Nappa that they will become Super Saiyans after gaining immortality from the Dragon Balls. Kanba and Trunks/Future Trunks' eyes in Super Saiyan forms are often shown to have black pupils within the green irises rather than pupil-less green eyes. This could either be a reference to them normally having colored irises or simply an animation error. Goku, when transformed with his tail in Dragon Ball GT, his tail does change color to gold when he is a Super Saiyan 3 but remains brown for 1 and 2, when both the tailed Super Saiyan 3 appearance and the first Dragon Ball GT Perfect Files guidebook cover seem to indicate that the tail should have turned gold. In Dragon Ball Z: Budokai 3, Dragon Ball Z: Infinite World, and Dragon Ball Z: Burst Limit, for Vegeta in his Saiyan Saga outfit, the tail will not turn gold when Super Saiyan. Also in Dragon Ball Heroes and the Episode of Bardock movie, Bardock's tail remains brown too while it changes its color to gold in one of the Episode of Bardock promotional posters. In Dragon Ball Legends, Shallot's tail turns gold when Super Saiyan. All of Goku and Vegeta's known male descendants have been able to transform into Super Saiyans. In the Budokai Tenkaichi series, as well as the movie Broly - The Legendary Super Saiyan, Broly's base Super Saiyan Form (before he turns into his Legendary Form) has blue hair instead of the usual gold. This is presumably due to the controlling device his father put on him, as in Broly - Second Coming, his Super Saiyan form had gold hair. This Broly - Second Coming appearance was made available as a secondary costume in the sequel games, as well as the Legendary Super Saiyan variation, which features whiter skin and torn clothing to match. In Cooler's Revenge, when Goku goes Super Saiyan, a bird that was killed when Cooler prepared to tear the planet apart was revived by Goku's transformation, which implies that Super Saiyans have a degree of healing abilities, although this only appeared in the film and he may have just transferred energy to the dying bird, like when Goku transferred energy to Frieza. In "Saiyans Emerge" and Bojack Unbound, a Human is seen with a shirt that says The Super Saiyan in the background in the crowd. In Broly - The Legendary Super Saiyan, Master Roshi briefly appears as a Super Saiyan whilst wearing different masks. In the Dr. Slump remake, Arale and a long-haired human boy both take on their own versions of the Super Saiyan form and then proceed to have a fight reminiscent of the ones in Dragon Ball Z. The form that the boy takes on turns his hair from black to silver. Chi-Chi's dislike for the Super Saiyan state is a reference to a social taboo in Japan, where a Japanese child dying his or her hair blonde is a sign of rebellion in the household. This is made more explicit in both the manga and anime of the Cell Games Saga, where Chi-Chi complains about Gohan becoming a rebel upon seeing Gohan in the Super Saiyan state for the first time. When contributing towards the Super Saiyan God ritual for Goku in Dragon Ball Super, the golden energy from the rest of the Super Saiyans causes Videl's hair to appear to take on the blonde hue of a Super Saiyan, despite her being human, though presumably this was a side effect for her being pregnant with Pan who possesses Saiyan blood (and is said to possess the potential to transform) and has a righteous spirit (though during the ritual itself this was due to her being an innocent unborn child free of any malice). In Xenoverse 2, Pan reveals she hopes to achieve the form someday though it is implied that her desire is partially out of vanity as she thinks she would look great with blonde hair. Ironically it is the form's blonde hair that is the main reason why her grandmother detests the form (due to considering it a sign of delinquency) and presumably Pan's desire to obtain it form due to its color would probably not sit well with Chi-Chi (though this depends on whether or not Chi-Chi views on Super Saiyans have changed in her old age). Though she has yet to achieve it in any official media, Pan is said to have potential to achieve to form under the correct stimuli (such as the arrival of evilest dangers). Additionally she presumably inherited S-Cells from her father (who acquired the Super Saiyan form in his early teens) which she past on to her children and descendants as shown by Goku Jr. who achieved the transformation despite having less even Saiyan heritage than Pan herself (refuting outdated claims that her Saiyan blood was too diluted). Additionally Pan does have a gentle spirit and is more dedicated to martial arts having trained since childhood. However presumably she has just never had the chance to acquire enough S-Cells nor been in a situation that would result intense emotions necessary to trigger it (as she like most Universe 7 Saiyans is likely unaware that it can be achieved through the alternate method discovered by Caulifla in Dragon Ball Super) as in Dragon Ball GT (which was made before Dragon Ball Super) she tended to rely on her more experienced and powerful relatives and friends to protect her against dangers the faced thus never found herself in a situation desperate enough to trigger it (even if she were to have achieved it the main villains in GT would have likely outclassed her anyways thus there was little incentive for her to achieve it to become stronger in order to defeat them). Additionally Pan's statements in Xenoverse 2 suggest that her desire to obtain the form is primarily for superficial reasons thus she may not take acquiring it as seriously as her father and Vegeta did. It is noted by Goku in Dragon Ball Super that if this transformation, along with its further forms, is combined with the Kaio-ken technique, the user will die due to the immense strain on the body. This is why Goku never attempted to combine the two (besides in the anime during the Other World Tournament where he was already dead). However this is seemingly ignored in Xenoverse 2 as the Saiyan Future Warrior can use the Kaioken and Super Saiyan forms together when using Kaioken based skills such as the Kaioken Kamehameha, x4 Kaioken Kamehameha, x20 Kaioken Kamehameha, and Kaioken Assault which cause the user to briefly use the Kaioken. However it is likely that this was either an oversight or was ignored for gameplay reasons as the Future Warrior can also use the Spirit Bomb and Super Saiyan Bomb while transformed into any Super Saiyan form while GT Goku can use the Spirit Bomb and Super Spirit Bomb as a Super Saiyan 3 (It should be noted that Goku could use the Super Spirit Bomb as a Super Saiyan Full Power during the battle with Kid Buu). Goku can also use the Super Spirit Bomb as a Super Saiyan 3 in his Turtle Hermit Gi (No Character) 6 skillset. In Dragon Ball Xenoverse, certain accessories that alter the Future Warrior's color and hairstyle such as Chi-Chi's helmet (which is ironic given Chi-Chi's dislike for the form), Fortuneteller Baba's Hat, Launch's wig (a reference to the similarities between Bad Launch and the Super Saiyan form), and Pan's Bandana will change color whenever a Saiyan Future Warrior uses any Super Saiyan transformations (interestingly this only applies to female Super Saiyans as they can only be worn by, or the accessory only alters the hair of, female characters). However it will not affect the hair color of accessories such as Goku's and Mr. Satan's wigs, nor Master Roshi's Beard. In Dragon Ball Xenoverse 2, the hair of Chi-Chi's helmet no longer changes color when the Super Saiyan form is used, while Launch's Wig and hair of Pan's Bandana retain their ability to change color while using the Super Saiyan or Super Saiyan 2 forms. However the hair of some of the new accessories such as Android 13's Hat and Future Mai's Hat do not change color. In Xenoverse 2, when Magetta's Suit outfit and Magetta's Head accessory are worn when any Super Saiyan form is used (though Super Saiyan 3 will cause the head accessory to be removed), they will glow white as if to imply the transformation is causing the suit and head accessory to become white hot (which fits with Magetta). The Hero from Dragon Quest VIII's hairstyle resembles Goten during the final moments of Dragon Ball Z, and even spikes up like a Super Saiyan but purple in color when the Hero's tension is maxed. This little feature was added to the American and European release of the game, as a shout out to fans of Toriyama's work. ↑ Highlights from Toriyama's Saiyan Q&A. twitter (November 29, 2017). ↑ Stated by Goku in Dragon Ball GT episode 29, "The Fall of the Saiyans"
↑ Super Saiyan Broly's second costume in Budokai Tenkaichi 2. ↑ Dragon Ball (manga) chapter 408, "Gohan Unleashed"
↑ Dragon Ball Z episode 185, "Awakening"
↑ Dragon Ball (manga) chapter 474, "Super Saiyan Level 3!!!" ↑ Dragon Ball Z episode 245, "Super Saiyan 3?!" ↑ Dragon Ball Z episode 155, "Super Vegeta"
↑ Dragon Ball Z episode 168, "Meet Me in the Ring"
↑ Dragon Ball Z episode 66, "Goku's New Power"
↑ Dragon Ball Z episode 95, "Transformed at Last"
↑ Dragon Ball Z episode 156, "Bow to the Prince"
↑ Toriyama Saiyan interview Part 1. pbd.twimg. ↑ Toriyama Saiyan interview Part 2. pbs.twimg. ↑ Dragon Ball Z episode 129, "Upgrade to Super Saiyan"
↑ Dragon Ball Z episode 207, "Take Flight, Videl"
↑ Dragon Ball Z episode 103, "Pathos of Frieza"
↑ Dragon Ball Z episode 127, "A Handy Trick"
↑ Akira Toriyama SEG interview. kanzenshuu. ↑ Dragon Ball GT episode 19, "A General Uprising"
↑ 37.0 37.1 "Twel-Boo Mysteries". kanzenshuu. ↑ Dragon Ball Z episode 120, "Another Super Saiyan?" ↑ Dragon Ball Z episode 130, "The Secret of Dr. Gero"
↑ Dragon Ball Z episode 135, "Deadly Beauty"
↑ Dragon Ball Z episode 136, "No Match for the Androids"
Why do Dragon Ball AF have the worst hate bandwagon? So I found the highest quality scans I could of the Broly Premium book.